A week ago I was talking with a friend about pie and they mentioned a rather easy and super-tasty tort. It’s like a pie and a cheesecake and it has blueberries. I love blueberries. And of course I also love pie and cheesecake. Today I added to my Sunday to-do’s the torte recipe that was sent special delivery by Edith. It was very easy and made the house smell great. Pre-heat your oven to 400F. Combine the butter, sugar and egg yolks. Stir in remaining ingredients until it forms a dry, coarse meal. Press 2/3 of the mixture into the bottom of a 9 in. spring form pan. Bake for 10 minutes and allow to cool. Press the remaining mixture 1 inch up the side of the spring form. Reduce heat to 350F. Set crust aside. Combine ingredients and let stand 15 minutes. Cook in medium saucepan until bubbly. Pour into crust. Blend ingredients and spoon over blueberries. Bake in over at 35F for 45 minutes. Allow to cool for about an hour. Then chill for 4 hours. 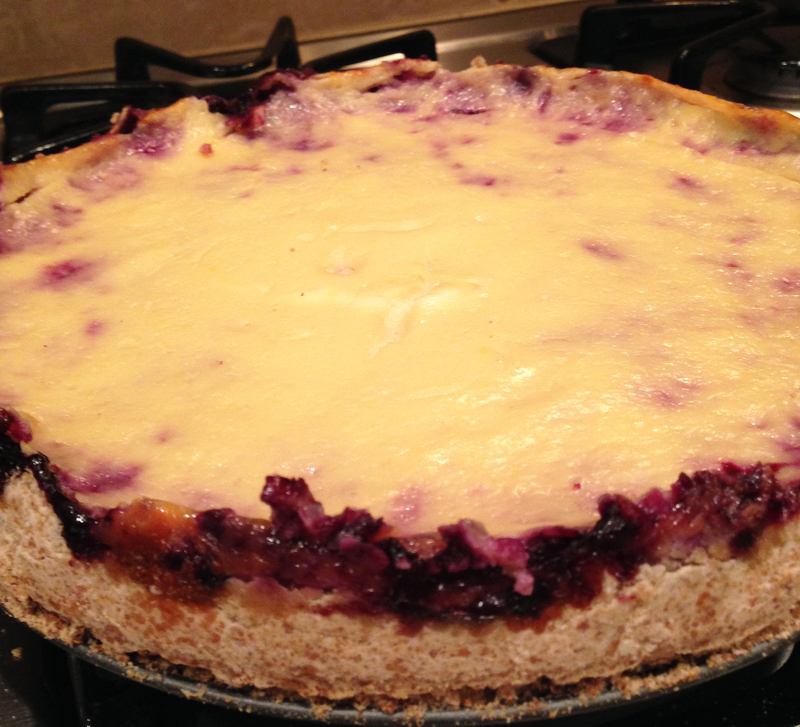 I love the taste of blueberries and the consistency of a cheesecake with a graham cracker crust. I would suggest greasing the spring form before pressing the crust. Most of the crust for the torte I baked is stuck to the bottom of the pan. I liked it and Andre, my stepson, liked it enough to have 2 pieces. I might do that too. I love blueberries. I put them on cereal, I eat them in bagels. Breakfast bars of course. I don’t care about antioxidants. If they do something healthy, that’s nice too. I just like the way they taste. That and they’re really purple. Who names purple berries blue? Blend the flour, sugar and salt in processor. Add butter and shortening. Using on/off, cut in until mixture resembles a coarse meal. Transfer mixture into large bowl. Mix in 5 tablespoons of water, adding more ice water by teaspoonfuls, if needed, until moist clumps form. Gather the dough into a ball; divide in half. Flatten each half into a disk, wrap in cellophane and chill at least 20 minutes. While the crust is chilling, prepare your blueberry filling. Yes, I meant to do that. Combine the blueberries, sugar, cornstarch lemon juice and lemon peel into a medium-sized saucepan. Cook over medium heat until mixture thickens and bubbles, stirring occasionally, about 15 minutes. Continue to cook 1 minute longer, stirring constantly. Cool until warm. Position rack in bottom third of oven and pre-heat to 400 degrees F. Roll out one disk of dough on a lightly floured surface to 12 inches around. transfer to a 9 inch diameter pie dish and trim dough so 1 inch hangs over the edge. Spoon the filling into the crust. Roll out the remaining dough to 13×10 inch rectangle, cut into 2/4 inch wide strips. I hope you have a ruler:) Arrange half the dough strips atop the filling, spacing evenly. Arrange the remaining strips at a right angle atop the first strips. Weaving is optional or, in my case, not realistic. Brush the crust edge with the cream so the strips adhere. Trim the dough strips even with the overhang on lower crust. Fold the edge of crust up over strips, pressing gently to seal. Crimp the edges decoratively. 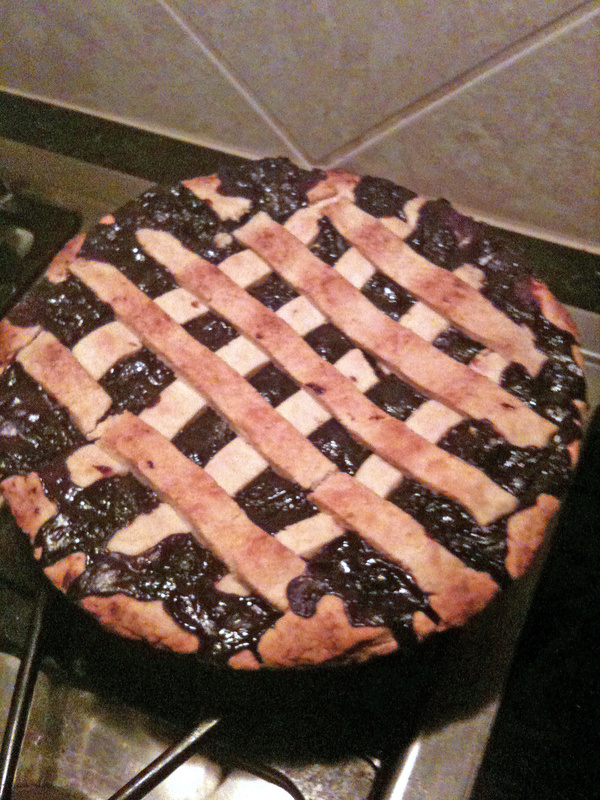 Brush the edges and the lattice lightly with cream. I didn’t do the previous six sentences, The cream was an oversight and the crust work was in need of some piecrust ninja. There wasn’t one to be found. Place the pie on baking sheet and bake until crust is a golden brown, about an hour. Cool pie on a rack for about an hour. Serve the pie warm or at room temperature with vanilla ice cream garnish. The pie bubbled over quite a bit and the presentation is messy but it’s tasty. And I like tasty just as much as I like blueberries, bubbled over or not. I bought a pie recipe book with 500 different types of pies and tarts. I then went to William Sonoma and bought some pie crust mix and a really sweet pie dish. I decided that my wife and/or kids will choose a random recipe from the Pie and Tart Book week and then I will put it all together on Wednesday evenings. My family and I will sample the wares every Thursday after dinner. My family seems very agreeable to this. Home baked dessert once a week? Fabulous! The monday before Thanksgiving I chose my first pie. 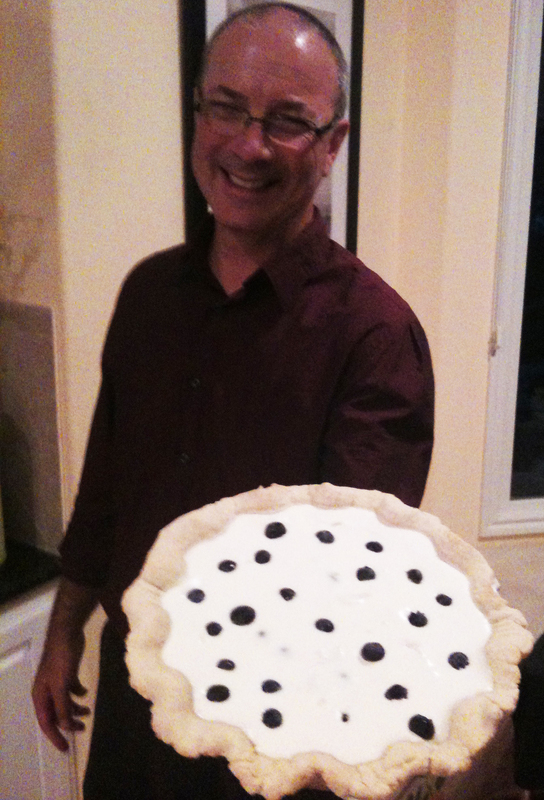 It was to be a blueberry yogurt cream pie. 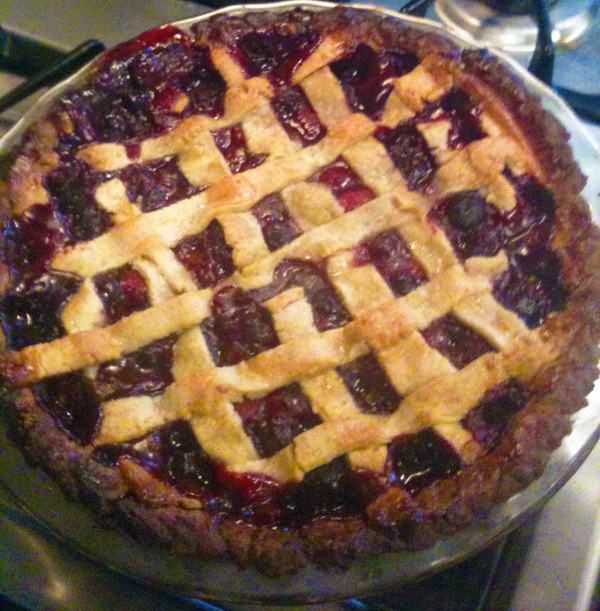 Being so close to Thanksgiving, it became the 1st pie on my baking adventure. Thanksgiving fell on a Thursday so the timing was perfect. Combine the flour and salt in a large mixing bowl. Cut the veggie shortening and butter into small chunks and add to the flour mixture. Using a pastry blender or two knives in a crisscrossing motion, blend until the butter and shortening mix with the flour and salt to give consistency of wet sand, with a few pea size pieces of butter and shortening remaining. In a separate bowl, using a whisk or fork. beat the egg with the vinegar and water. Blend into the flour mixture and stir until mixture is moist. The dough should be able to be formed into a ball. Divide into 2 balls and wrap each one in plastic wrap. Form into a flat disk and chill for a minimum of half an hour. When you’re ready, lightly flour a surface to roll out crust. Remove one disk from fridge and roll out from center to edge, until you have a crust that extends an inch past your pie plate. Transfer the pie crust to your pie plate and carefully press in. If cracks appear during transfer or when in’s in dish, push seams back together with lightly floured fingers. Crimp edges decoratively. Bake for 15 minutes at 350F. Transfer to wire rack and leave it to cool. In a small saucepan sprinkle the gelatin over the water. Set aside for a few minutes while you fill a large bowl with ice and cold water. Then cook the gelatin for 3 to 4 minutes until dissolved. Pour the gelatin into a metal bowl filled with 1/4 cup of the whipping cream. Chill, stirring occasionally for about 10 to 15 minutes, until the mixture starts to thicken. Using a separate bowl and electric mixer, beat the remaining cream into stiff peaks. Gently fold the cream and 1 3/4 cups of blueberries into the chilled yogurt and gelatin mixture. 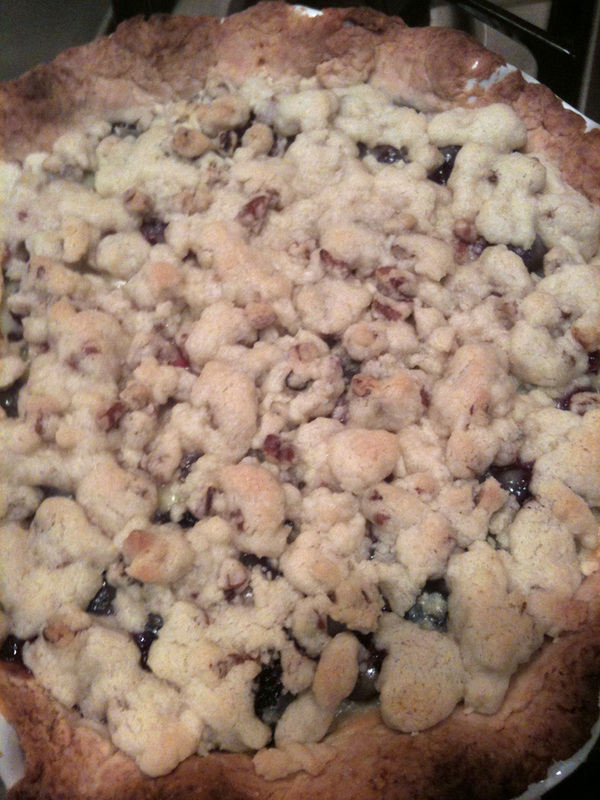 Pour the mixture into the cooled pie crust and place the remaining 1/4 cup of blueberries over the filling. Voila! Pie #1! Fifty one to go!! !